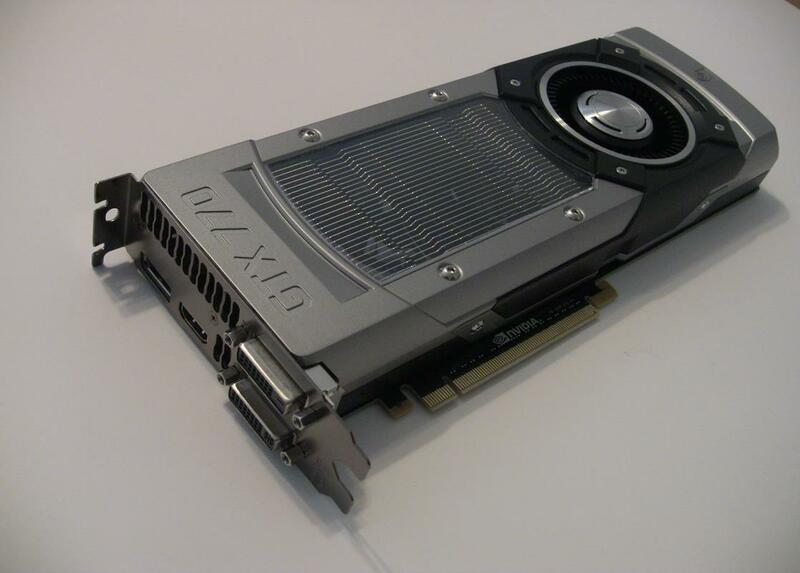 NVIDIA not only launched a pretty fast card in the GeForce GTX 780, they also launched a new Kepler card in the price range of $399 with the GeForce GTX 770. The card sits in a nice price slot as to not break the bank but also looking to provide top notch performance. The reference card that NVIDIA was kind enough to send me has a solid feel and design, exactly like the GeForce GTX 780. So what specs can you expect from this card? Let’s have a look. 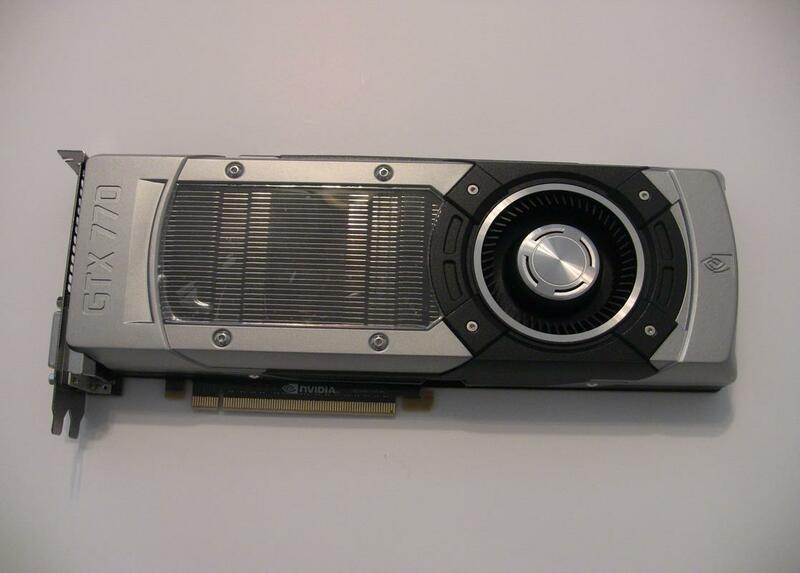 Compared to the GeForce GTX 780, the GeForce GTX 770 has 768 less CUDA cores, but has a 183 MHz faster base clock and a 185 MHz faster boost clock. 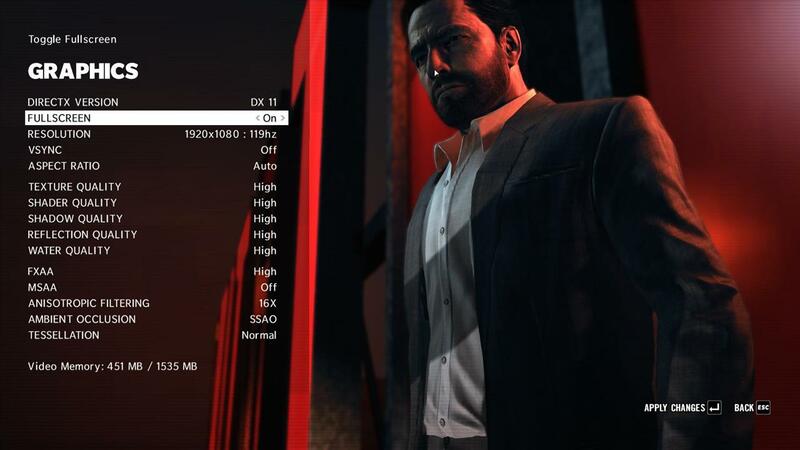 Also, the memory is clocked at 7.0 Gbps versus the 6 Gbps that the GeForce GTX 780 has. These factors help increase the performance of the card that was lost to the removal of some CUDA cores. It does have 1GB less memory at 2GB while the GeForce GTX 780 has 3GB of memory. Still, you can see that the GeForce GTX 770 has a lot going for it in terms of getting performance from faster clock speeds. 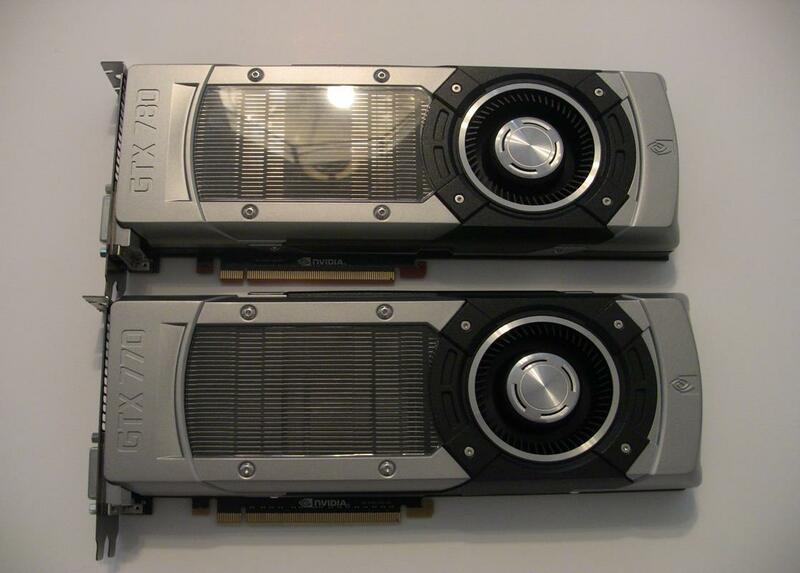 The GTX 770 measures in at 10.5” in length, or a half inch longer than a reference GTX 680. 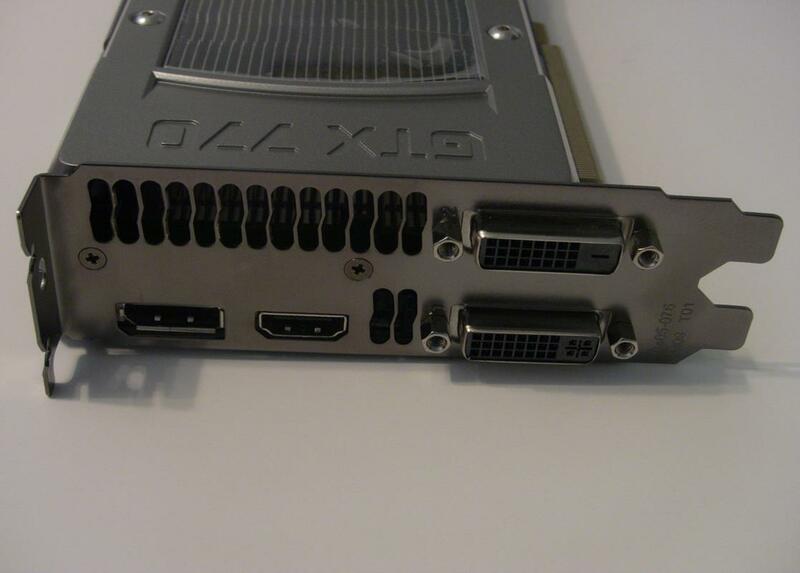 For connecting to a video source, the reference GTX 770 has one full sized HDMI port, one Display Port, one Dual Link DVI-D port, and one Dual Link DVI-I port. 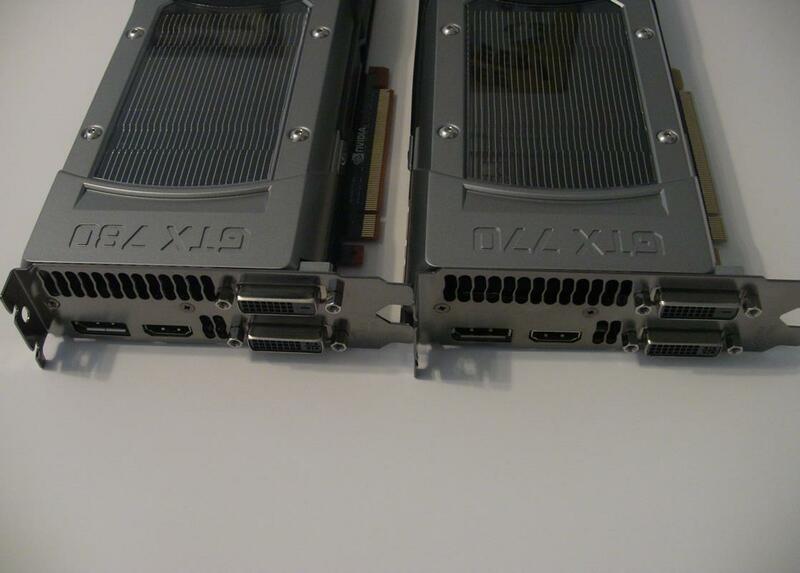 The card is a dual slot card, like all of the high end cards from NVIDIA. 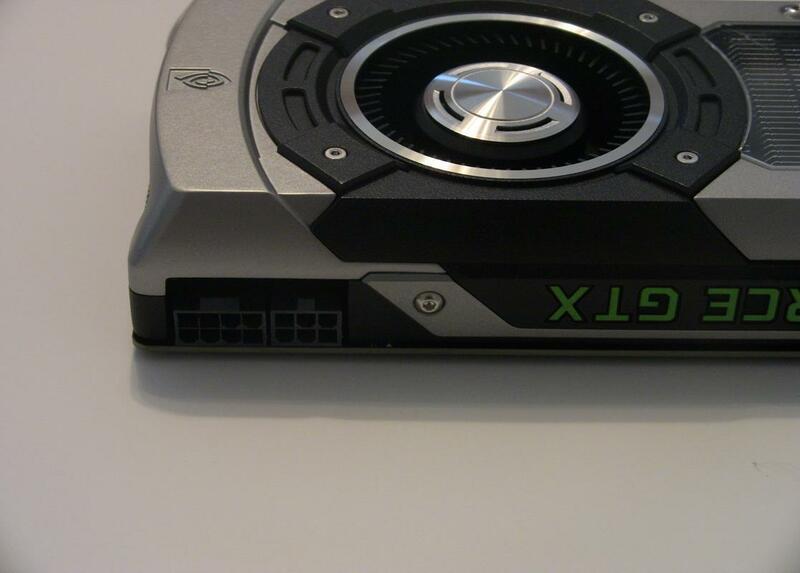 NVIDIA has really tried and make the GTX 780 much quieter to use. When gaming, one of the things that I do find annoying is hearing the video card as it ramps the fan speed up to cool down the heat generated from the intense calculations done when rendering 3D content. 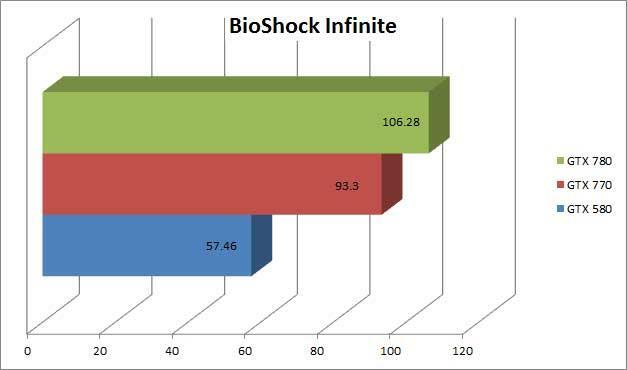 With the GTX 780, you’re looking at around 3dBA less according to NVIDIA’s graph. The GTX 580 and GTX 680 aren’t that loud to begin with when playing, but the GTX 780 should improve on an already quiet setup. On top of the card, there’s connectors for a three-way SLI setup. If you’re playing with surround gaming using three monitors or even one very high resolution monitor, you’ll be able to pair one or two more of these cards up to grab some nice performance boost. 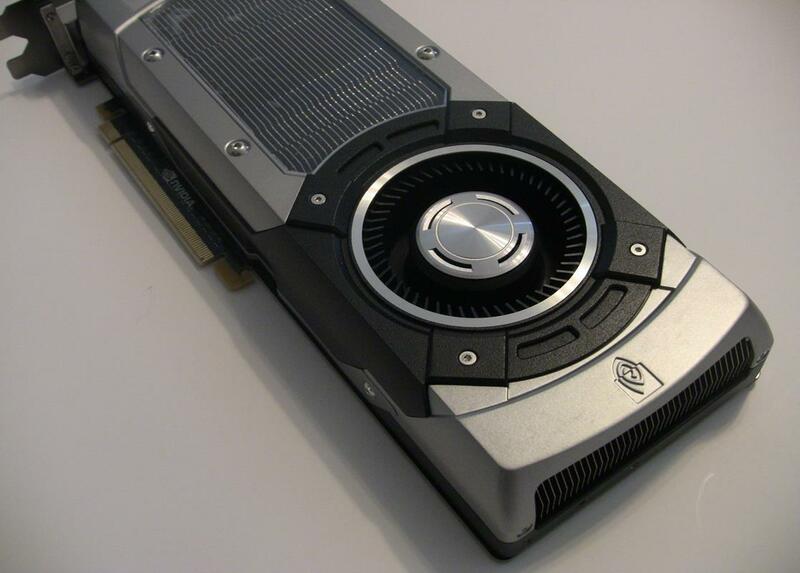 The pictures that NVIDIA showed has has this really cool metallic bridge that they say will be made available to consumers sometime in the near future. One eight pin and one six pin power connector are also on top to power the card. When in use, the GeForce GTX logo lights up in a nice green glow so for those with windows in their cases, you’ll be showing off who powers your graphics in style. 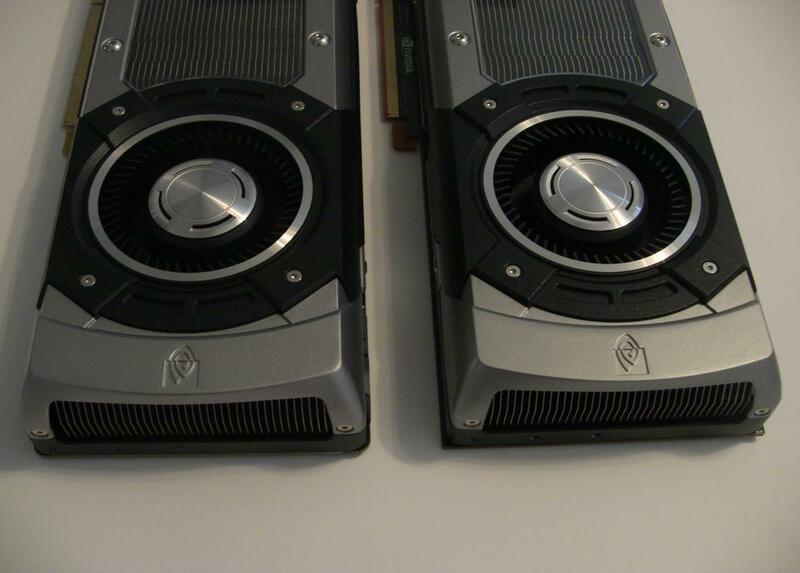 All tests were ran with the latest NVIDIA drivers for their respective cards. Also, I decided to go with all games this time around, foregoing on any artificial benchmarking programs. 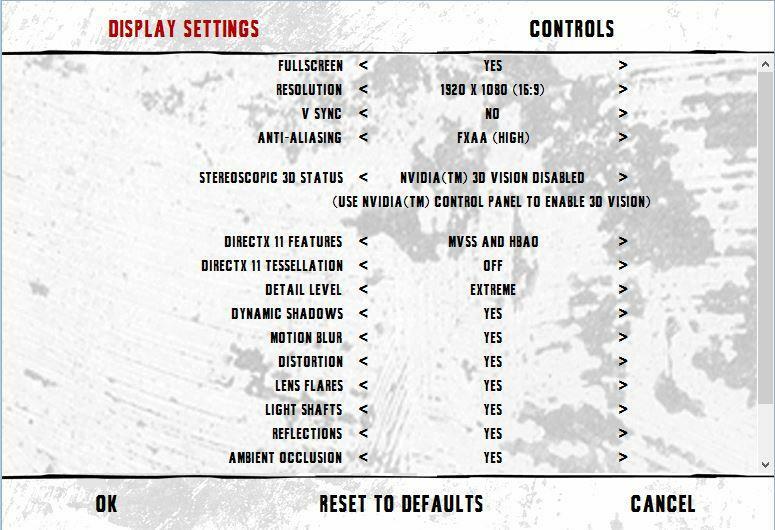 I’ve attached a screenshot of each game’s settings. 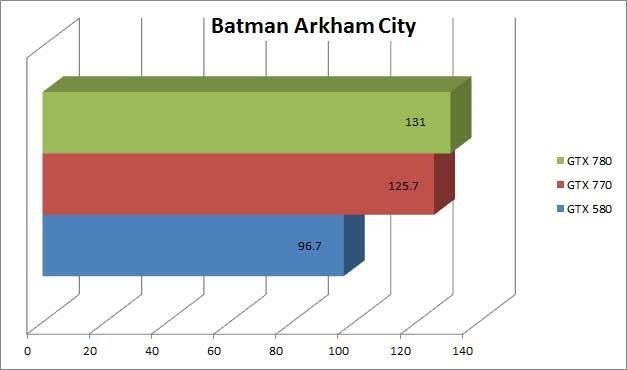 Batman Arkham Asylum used the built in benchmark and tests were ran 3 times. What you see is the average. 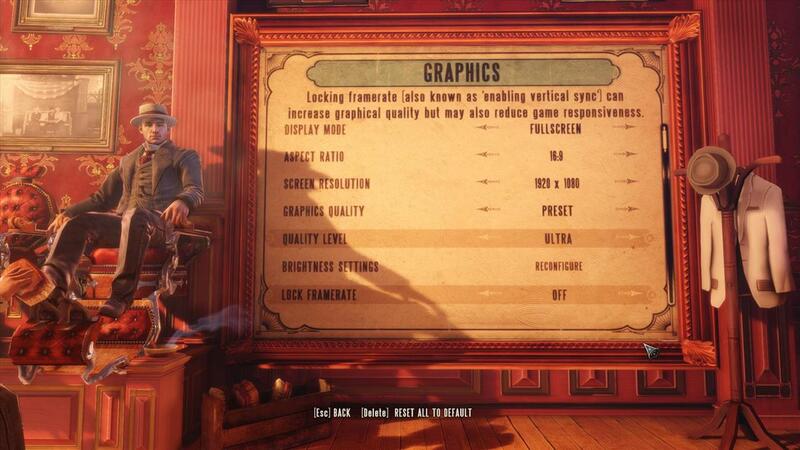 BioShock Infinite used the built in benchmark that took you through various areas of Columbia. Tests were ran 3 times with the average displayed below. 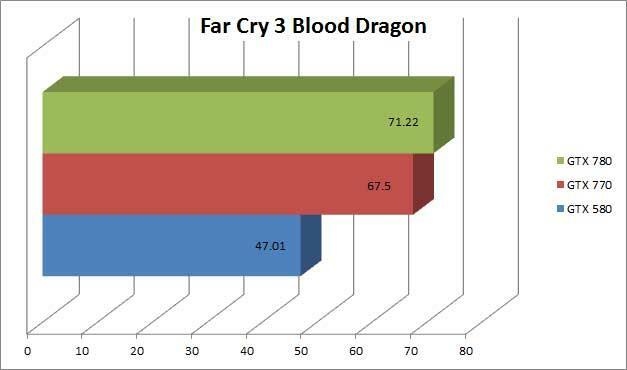 Far Cry 3 Blood Dragon was tested using Fraps and using the first sequence where you ride a helicopter around the base. I picked this area because it’s easily repeatable. I used Fraps to test Max Payne 3. Picking Chapter III in the arcade mode, I ran the first few minutes and tried to duplicate what I did. 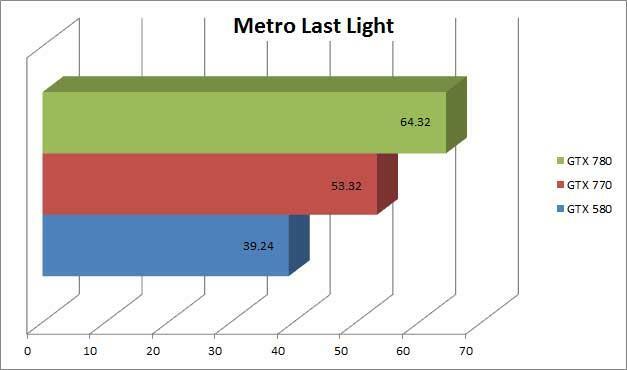 Again, the average of three scores is shown below. 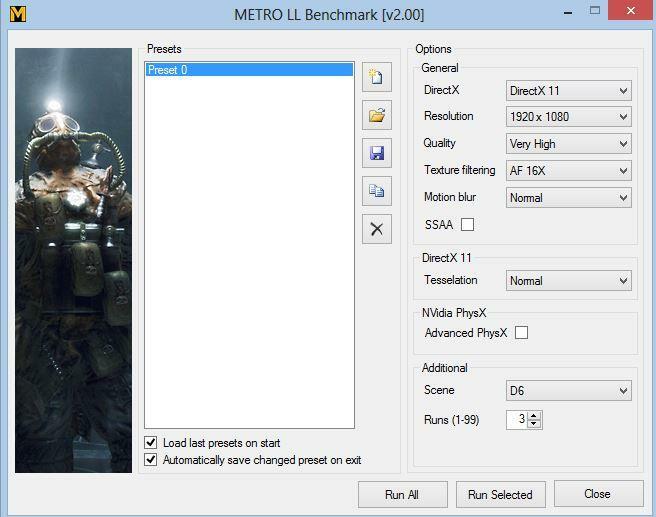 Metro Last Light has a nice little built in benchmark that I used. You can set various options and I had the tests run three times. It also displays the results in a nice web page complete with graphs on how fast the various parts rendered. 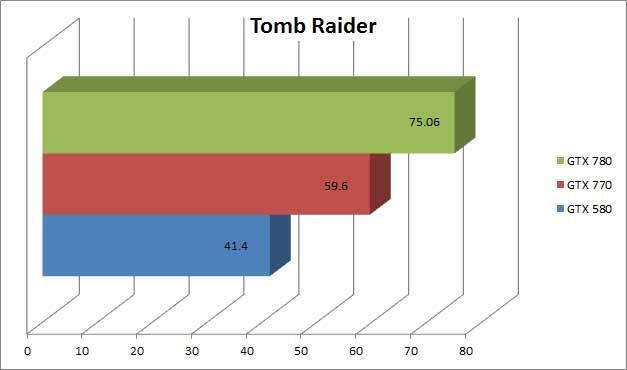 Tomb Raider from Crystal Dynamics has a built in benchmark that I used where the camera panned around Lara Croft near some wreckage. Below you will find the average score of three runs. 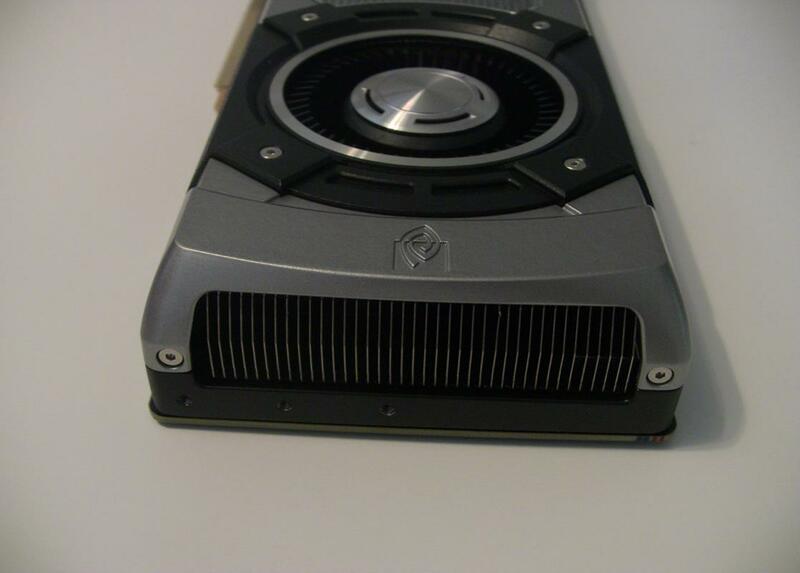 You can see with the faster memory and improved clock speeds, the GeForce GTX 770 did a wonderful job at keeping up with the more expensive GeForce GTX 780. The performance here is definitely nothing to sneeze at and at the price point NVIDIA is putting this card out at, you can expect to get a great deal of power for your money. You’re talking just a 5 to 20% decrease in performance over the GeForce GTX 780 at 39% less in cost so you’re getting some pretty good bang for your buck here. The card also ran very quietly when tests were being conducted as well as playing some long sessions of gaming in the past week. It definitely sounds quieter than the GeForce GTX 580 and you’ll probably be oblivious to when it ramps up during gameplay because other fans such as the case fan or power supply fan will drown it out. It’s not all about the card though as software to drive the card is important. 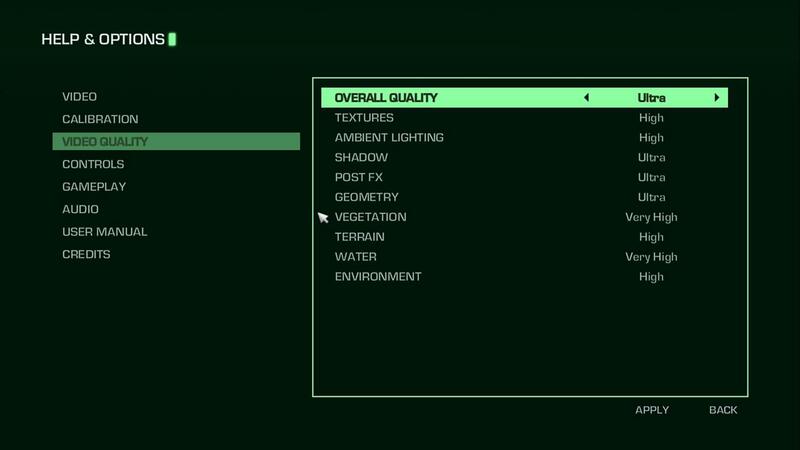 GeForce Experience is a big initiative by NVIDIA to help ease the setup process of a game’s setting to give you the best experience possible at the best frame rate possible. 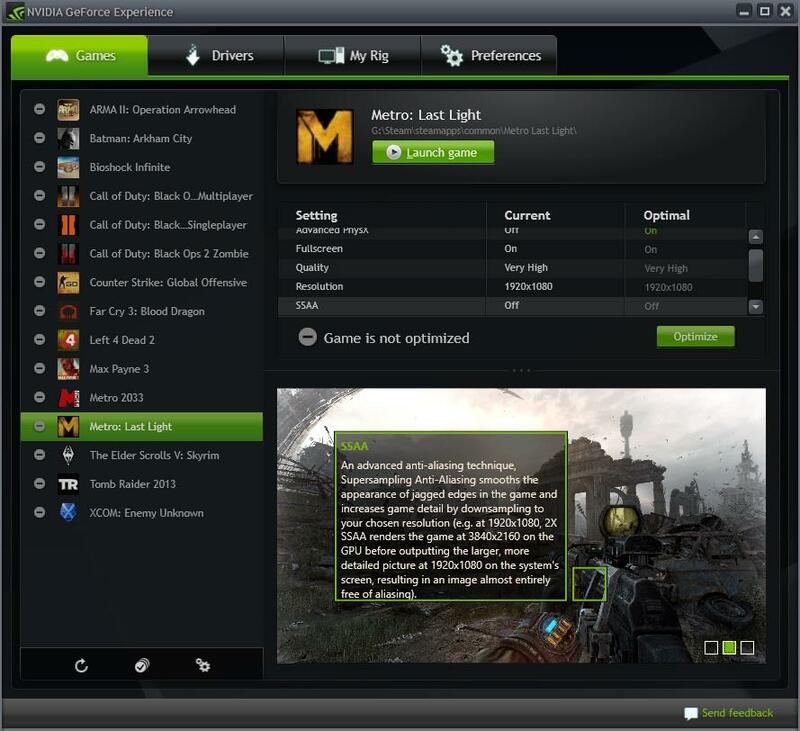 As a programmer, I love to create software to make my life easier and the GeForce Experience is made just to do that. 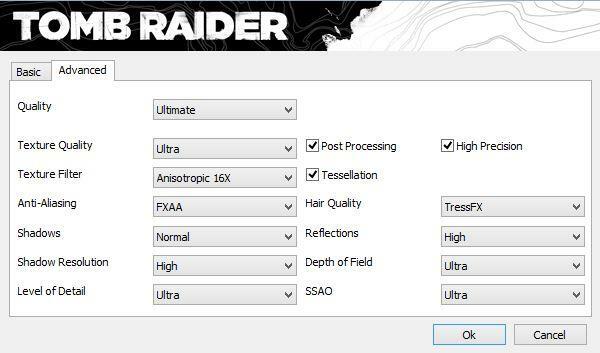 No longer do you have to test each and every setting to get the best graphics possible for your setup as NVIDIA has done most of the grunt work for you. Something I like about the software is that you’ll be shown various screenshots and given notes on how each feature is improving the visual quality. That can really help those who don’t have the knowledge on what they are turning on to know exactly how it’s going to make their graphics better. One of the new features that NVIDIA’s working on graphics’ wise that interested me immensely is ShadowPlay. As one who’s now streaming a lot of what I play on the computer using Twitch.TV and Open Broadcaster, the potential of ShadowPlay intrigues me. Right now, it’s only used for recording and taking advantage of Kepler’s hardware accelerated H.264 encoder to let you record your gameplay at great video quality without sacrificing much of your gaming speeds. You can set it up to record the last 20 minutes of automatically or manually start and stop your recording. But, you know what a lot of us want who are into Twitch is the ability to stream straight from our computer without using software such as Open Broadcaster or XSplit. That was asked during a presentation and NVIDIA’s open to improving ShadowPlay to do that. Let’s hope that do that soon as I think that would be another feature to distinguish itself from the competition with streaming being built right into the software provided by NVIDIA and without having to depend on some third party software to do it. ShadowPlay isn’t available yet, but I’m excited to see it in action and what it can bring to the table in both recording and possible streaming capabilities. Also, GPU Boost has been improved allowing for temperature level specification. You can set a card to run at a certain temperature and GPU Boost 2.0 will do various things such as ramp down the card and ramp up the fan speed when necessary. Its goal is to maximize the performance at a certain temperature you desire and NVIDIA has stated this is a much better way to get a consistent performance out of a card over a clock monitored option. Of course, you can still do some manual settings, but GPU Boost 2.0 should make for a more well rounded experience. The GeForce GTX 770 comes in at $399 making it a very, very nice priced card for the performance you can get out of it. This Kepler based card is clocked nicely with faster memory to help compensate for the omission of some CUDA cores from the top end GTX 780. It runs at a nice pace compared to the GTX 780 while being at a lot more affordable price range. It’s hard not to recommend this card if you are more than a generation behind as you’ll get some nice perks with PhysX and 3D Vision possibilities. I was very pleased at how well it did and think it’s a great buy for those looking to upgrade with cards in the 5XX range or below. The GeForce GTX 770 is a surprise performer for me since you're getting speeds that are not too far off the much more expensive GeForce GTX 780 at a price point of $399. It's a great card that's built well and quiet to boot. With features such as PhysX and 3D Vision, you're looking at a great card to pickup for a variety of games coming out and available today.